STATE Becons 6 Wolf grapplers! Vann Brasher and Anthony Gowdy duplicated their 1-2 finish at the District Championships at the Region 2 Championships. Brasher and Gowdy dominated the 112 lb Division and met in the finals for the 2nd week in a row. Also qualifying for a trip to the Tacoma Dome and the State Championships were Matt Ferris (2nd @ 103), Andy Chinn (4th @ 130), Mike Ruiz (3rd @ 160) and Joe Shaw (3rd @ 215). Get your tickets now for Mat Classic XV to see these Sequim stand-out athletes this weekend Feb 20-21!! Wolves Qualify 7 For Regional Competition! Vann Brasher led more than half a Bakers dozen on to White River High and the Regional Championships this weekend. Brasher won the 112 District Title while his protégé Anthony Gowdy finished 2nd. Matt Ferris (103), Andy Chinn (130), Mike Ruiz (160), Joe Shaw (215) and Matt Gallup (275) will also be heading to Buckley. The Region 2 Championships, which include the notoriously weak Metro League, usually mirror the District Championships. What does that mean? Well, look for 7 Sequim wrestlers to head to the Tacoma Dome for a State Championship assault!! The Sequim Wrestling team eeked out a hard fought victory over a tough Klahowya Eagle squad by virtue of more match wins (7-6) after the final score ended up 33-33. In an epic home match, Sequim was set up with a 6 point lead after Mike Ruiz came from 0-5 down to defeat Brent Collier. The Wolves were poised to finish off the Eagles, but Andy Hedman stuck James Henning to earn 6 points and tie the score in the final match of the evening. In the last home match of their Sequim careers, seniors Garrett Buerner, Mike Gaddis and Brandon Fuellas all had impressive, determined victories. Senior Vann Brasher lost in a tense battle to undefeated Ryan Fitts, 16-11. The Wolves finished the season 7-1 in league, just behind Vashon, and now get ready to for District competition. The Sequim Wolves defeated Forks and Port Angeles to retain their claim as the top team on the North Olympic Peninsula. Both P.A. and Forks came to Sequim Saturday for the Annual Peninsula Shootout. Joe Shaw pinned both his opponents for the Wolves. The wolves wrestled well and aggressive, but were outgunned by a better team. thr pirates state caliber trio of bennedsen, rudisky and mattingly took a combined 6:44 to pin their 3 sequim opponents. hould have a good next couple matches including a huge dual against Klahowya on Tuesday. The Wolves marauded the Steilacoom Sentinels in front of a boisterous crowd in the Rick Kaps Memorial Gym Thursday. Sequim got a huge lift from the Freshman contingent of James Henning, Zeb DeBello and Lucas Woolsey, who opened the match with 3 straight pins. In the night's wildest match, Jeff Rockenbrant pinned Steilacoom's John Resseguie in the 3rd round with the score 30-28 or something. Rocky threw in the unconventional "double fish flop flip" move which nearly ended up in disaster and brought the Steilacoom coach off the bench to protest. The Wolves will be in Olympia Saturday for the Timberline Tournament. 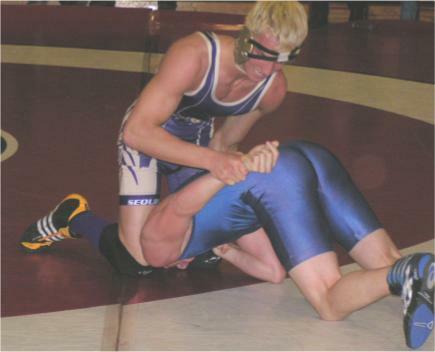 Sequim took points at every weight but 145 and 152 in trouncing a befuddled Eatonville squad in the back end of a double dual in Pt. Townsend. Gowdy, Gaddis and Jeff Rockenbrandt were the evenings double winners. Both Joe Shaw and Mike Ruiz sat out the matches with health issues. Sequim got huge wins from Anthony Gowdy, Mike Gaddis and Nick Dickson in beating a tough Orting team in the first half of a double dual meet in Pt. Townsend. Freshman Zeb Debello also looked good in defeating Josh Jenison. Wolves Compete in "Best of the West"
The Wolves traveled to lovely Pasco to compete in the "Best of the West" team dual competition. The BOTW draws highly competitive teams from Washington and Oregon to go at each other over 2 days. 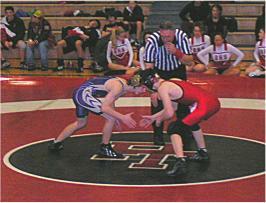 Sequim competed in 5 dual matches and finished winning 3 and losing 2. They opened with a win over the Bears from Olympia, WA after being down 25-11. They then faced off against last years BOTW winner and perennial powerhouse Newberg, OR. Mike Ruiz was an OT winner at 160 and Vann Brasher stuck his opponent at 112 to gain the Wolves their only points as the Oregon team won 54-9. Avenging that loss against Mountain View, OR, the Wolves got important wins from Matt Gallup and Anthony Gowdy. The next opponent was the 3rd seed, Clackamus, OR and the Wolves narrowly lost 40-36. In the final match, the worn-down Wolves persevered over an All-Star squad from the Tri-Cities, WA. With Andy Chinn, Gallup and Joe Shaw out will various ailments, the remaining boys wrestled hard and won 60-30. For the week-end, Ruiz won all 5 of his matches to run his season record to 13-1 and Brasher won 4 of five to move to 8-2. The Wolves next host the Rainshadow Tournament in Sequim, January 2-3. The wrestling team opened up the season December 5-6 at the White River Classic tournament in Buckley with a pretty fair showing. The young team showed heart with Senior Vann Brasher and Junior Mike Ruiz each placing 2nd. Brasher lost 12-10 in the 112 lb finals while Ruiz took a fall in the 160lb finals. Sophomore Joe Shaw placed 5th at 215, Mike Gaddis took 6th at 140 as did Matt Ferris at 103. Both Andy Chinn and Anthony Longoria wrestled well (2-2) but did not place. All divisions were 16-man double elimination brackets and the WRC attracts top teams from around the State. Sequim placed 10th out of 15 teams.